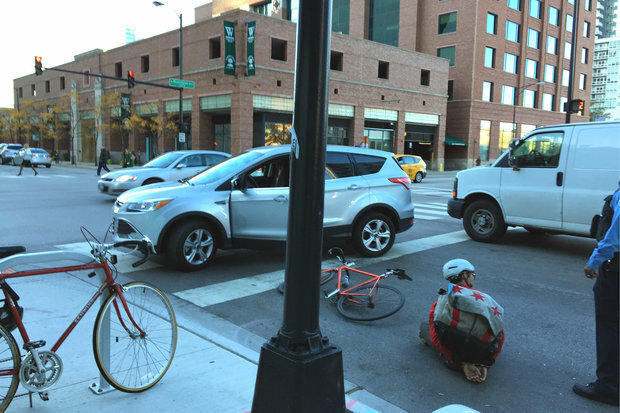 Biker James Liu, shown handcuffed and sitting, was arrested for disorderly conduct in the West Loop Wednesday after he hit an SUV swerving into the bike lane with his hand. The SUV's driver was an off-duty cop. WEST LOOP — A Chicago bicyclist who knocked on the door of an SUV as it drifted into a bike lane in the West Loop said the move was meant as a firm warning to the driver to watch out for cyclists. What he didn't know? That he would end up getting handcuffed by the driver of the SUV. He turned out to be an off-duty police officer. James Liu, an attorney who lives in Logan Square, was cited for disorderly conduct on North Desplaines Street Wednesday after he hit the swerving silver SUV with his hand, he told DNAinfo Chicago. A witness first reported his account of the ensuing incident on Chainlink.org, a community forum for Chicago bikers. At about 8:15 a.m. Wednesday, Liu was biking to work, traveling south in the Desplaines bike lane in the West Loop. 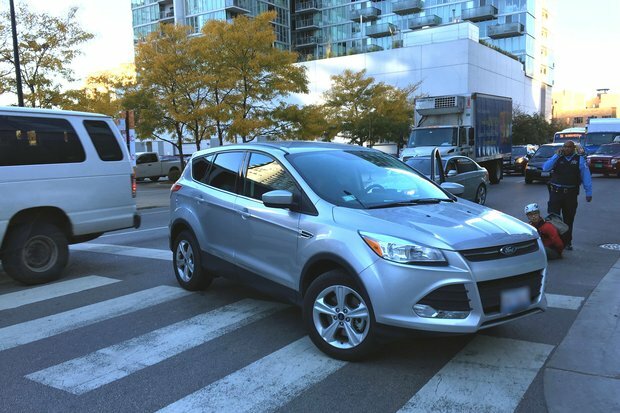 On Desplaines south of North Milwaukee Avenue, the silver SUV swerved to the right, covering part of the bike lane, according to Liu. In an effort to alert the driver that he was on his bike and using the lane, Liu said that he struck the car twice with his hand. "I tapped hard on the body panel twice," Liu said. "Boy howdy, did I get his attention." The driver then pulled up next to Liu and yelled out the window that he was "a f------ cop," according to Liu. Cyclist Rachel Havrelock was also traveling south on North Desplaines Wednesday morning. She said the SUV was weaving in and out of lanes, and at points was "really, really close" to a cyclist. The SUV was "moving quickly and recklessly. I said out loud, 'Wow, that's dangerous,'" Havrelock said. After the interaction, the SUV and Liu, on bike, continued down Desplaines, which includes sections of unprotected bike lanes and barrier-protected bike lanes. As he approached Washington Boulevard, Liu traveled across lanes so he could turn left onto Washington near the Catalyst Apartments building. But before he could turn left, the SUV switched lanes, cutting Liu off. Then, the off-duty officer got out of the SUV, Liu said. The officer, who was in uniform, directed Liu to put his hands on the SUV, then handcuffed him, the cyclist said. Ben Raines, a cyclist who was traveling the same route as Liu, said he pulled his bike over when he saw the biker handcuffed. The SUV was not damaged, he said. Liu, an attorney who works in the Loop, said that he asked the officer what he was being arrested or detained for. The officer did not respond, Liu said. Liu repeated the question several times, asking why he was being detained. The officer again did not respond, said Liu, who said he told the officer that he believed his Civil Rights were being violated. "After several times of demanding to know what I was under arrest for, he responded, 'Reckless conduct,' " Liu said. At that point, the off-duty officer called 911, asking that a marked car pick Liu up. A law enforcement source confirmed the off-duty officer called 911 requesting a marked police car respond to the scene. After repeated requests Thursday, police did not immediately comment on the incident. Liu was transported to the 12th District Police Station, searched and presented with a citation for disorderly conduct with instructions to appear in front of a hearing judge on the charge. He is scheduled to appear before a hearing judge at the city's Central Hearing Facility in November, where he plans to plead not guilty to the disorderly conduct charge. He said the arrest was "an abuse of power" and said he is concerned that police never read him his Miranda Rights. "I think [the officer] got angry," Liu said. Editor's note: A quote from Ben Raines was misattributed to Rachel Havrelock in a previous version of this story.